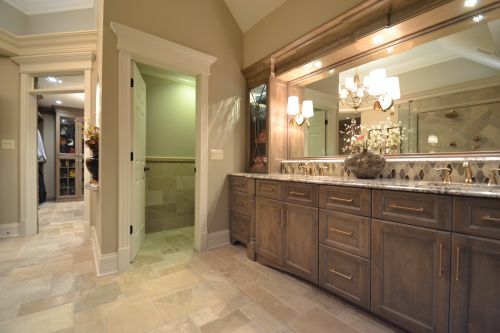 The very best remodeling projects are the ones that perfectly blend beauty and convenience. A recent project we worked on is the ultimate combination of the two. 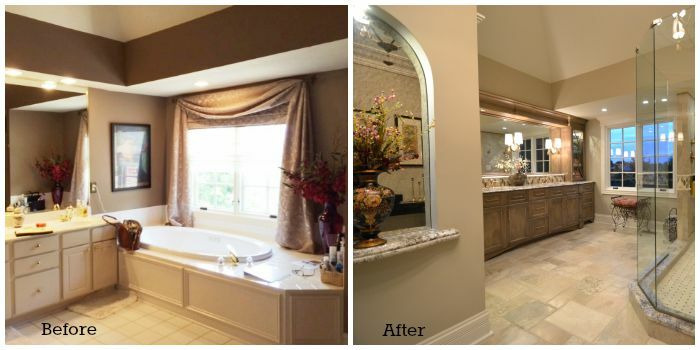 We were able to give our clients the master bathroom and dressing area they always wanted, with every element they needed to make the space perfect. As you can see, we made some pretty big changes to the space. Let’s take a closer look at some of our alterations. One of the biggest changes we made in the bathroom was removing the large whirlpool tub and putting in this shower with single-paned glass doors. A larger shower was at the top of our clients’ priority list, and we were able to install a shower that is both spacious and gorgeous. We especially love the tile detail that wraps around the shower. Because we removed the whirlpool tub, we were able to extend the length of the vanity. We also updated the vanity to this gorgeous wood, and added brass pulls. Above the sink, we repeated the tilework found in the shower, and we added additional light fixtures. One of the most unique parts of this remodel (and one of our favorites!) 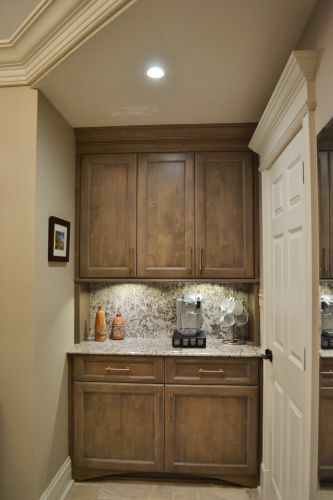 is the conversion of a small closet into a coffee bar area. Having fresh coffee available on demand as you get ready in the morning is an awesome luxury, and one we were excited to create for our clients. For this area, we repeated the cabinetry from the vanity, and continued the countertop upward to create a single-slab backsplash. 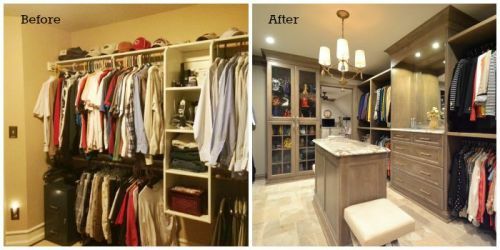 We continued the cabinetry from the bathroom into the large walk-in closet, which we transformed into a lovely dressing area. We added lots of extra storage, including drawers and cabinets with glass doors. We also updated the lighting to make it optimal for dressing and make-up application. The addition of a small island in the middle of the space offers a place to enjoy your coffee as you prepare for the day. Our team truly enjoyed bringing this project to life, but our greatest satisfaction came from not only meeting but exceeding our clients’ expectations for the remodel. Do you have a dream for your home that you would like to turn into reality? Our team can bring your vision to life, and even go above and beyond your expectations to create a room you love. Now is the perfect time to start your dream project, because we’re offering no-interest financing for 24 months for qualified borrowers, through October 31st. Contact us today to get started, or take some time to browse our Project Gallery to find inspiration for your own home transformation.